A few months ago I was sent a new book to have a read over. Maternity Leavers by Soozi Baggs. At the time I was still on Maternity Leave, and umming and ahhing as to what to do in terms of work. Do I go back to work full-time or part-time? If so, do I put Isla in a nursery, or find a childminder? Do I not go back at all? Do I find some work to do at home? There are so many options of what to do when your maternity leave comes to an end. Maternity Leavers by Soozi Baggs looks at all of those options, and talks you through the pros and cons of each so that you can make a fully informed decision as to what is best for you, and for your family. There were so many lines in the book that really resonated with me. At the end of the day there was one paragraph that really helped me make my final decision. Things that I had been thinking over for a long time, but seeing them in black and white made me realise they were valid points. Is it worth doing my job for that much pay? Ask yourself whether you will feel resentful if you’re working all day and bring home twenty quid ‘profit’. When Chris and I sat down and looked at money. How much I’d bring home, childcare vouchers, and nursery costs, with me working part-time (what I would want to do if I went back to work, and luckily for me, there was a part-time post available for me if I did return to work). It just didn’t work out. We’d be £250 worse off a month. And is my career progression worth it? In my job there was no option of career progression. There was no further I could go. I would just end up doing the same thing for the rest of the time I was there. And in my mind I felt that it was not worth it. I needed to feel valued there, and feel like I could improve my career prospects while there. I think it was the best decision I’ve ever made, and have been so much happier since doing so. Running up to the end of my maternity leave I was getting stressed, and having sleepless nights over the thought of returning to my job. Soozi also mentions one of the best things I’ve found about being at home with Isla “…being there for all the milestones instead of hearing about them from a childminder or nursery staff.” I got to see Isla take her first steps. I would have hated to have missed this and her nursery staff to see them first instead. At the end of the book there are also lots of resources which are helpful. Links to benefit calculators and information on childcare costs. Websites and phone numbers for Maternity Action (very helpful for me when my HR department were about 9 years out of date with their maternity policy and so totally illegal in what they were trying to do to me in terms of my annual leave/maternity leave at one point!!). Websites advertising jobs specifically for mums, and Soozi’s own website where she updates her resource list regularly. 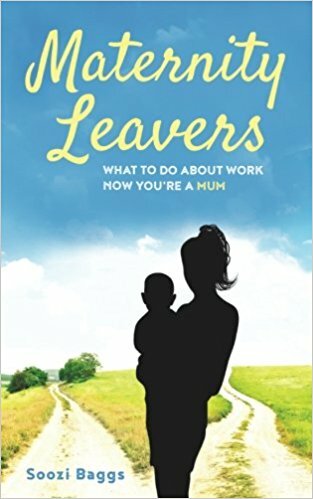 If you are undecided about returning to work, or what to do when your maternity leave ends, then I strongly advise reading Maternity Leavers by Soozi Baggs. It can really clarify a lot of things for you, and help you make your decision. Disclosure: I was sent this book for free for the purpose of this review. All thoughts and opinions are my own. This sounds like a great book – maternity leave can be such a confusing time! I totally lost my confidence first time round and hated going back!! It’s great that you found this book so helpful. I found thinking about returning to work stressful but for us it worked out financially and the career path was there. It’s hard sorting through your thoughts though so to have some help with ordering your thinking etc would have definitely helped! I had the same struggle after my first born, the cost of childcare would have been more than my wages and it was a job not a career. I think life works things out, I now have 3 jobs plus my blog, all fitted around my 3 kids!